This recipe is the first (well, the second I guess because I think that the Tamales count) of many that I will feature that are not only delicious, but have played an important role in the growth of a culture or the success of a people. I think that food culture is outrageously important and recreating culturally classic recipes helps me relate to a different history, era or experience. As a humanist, I feel that this is quintessential. That being said, there are countless things that I miss about Rome, the greatest of them being the people who I left behind. 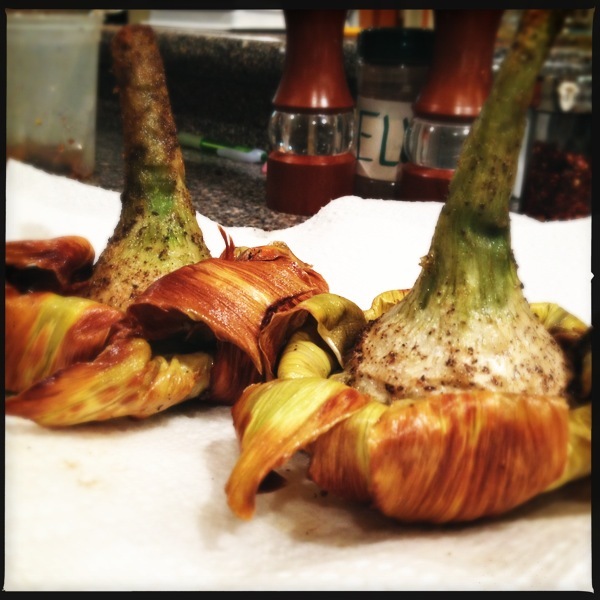 Close second however, might be Carciofi alla Giudia. I can still remember the first time I experienced their crunchy leaves, tender heart and my favorite part, the perfect stem. This occurred solely on the insistence of Mr. Crowly, a friend who regularly frequents Rome and who allowed me the wonderful experience of a private tour of the inner lairs of the Vatican. And I am eternally grateful for each of these things. Start by squeezing the juice of a half of a lemon into a nonreactive bowl and add water. This is for soaking the artichokes in after cleaning them so they do not brown. Begin preparing your artichokes. This, to me, is the hard part but it gets easier each time and as you become more familiar with an artichokes layers and insides (how romantic). Begin by trimming the thorny end of the artichoke, horizontally. Remove the loose, tough outer leaves around the outside until you get to the soft, yellow leaves. 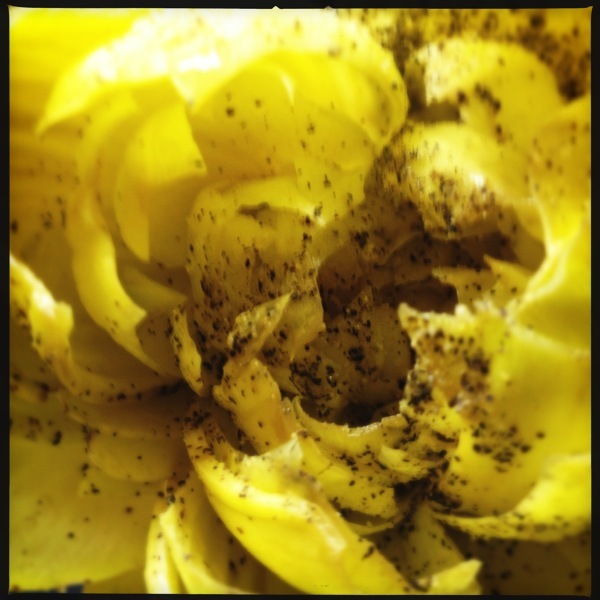 Scoop out the artichoke, leaving the leaves and heart intact. Be sure to trim the pointy tips of the inside leaves so that they don’t poke you when you chew. 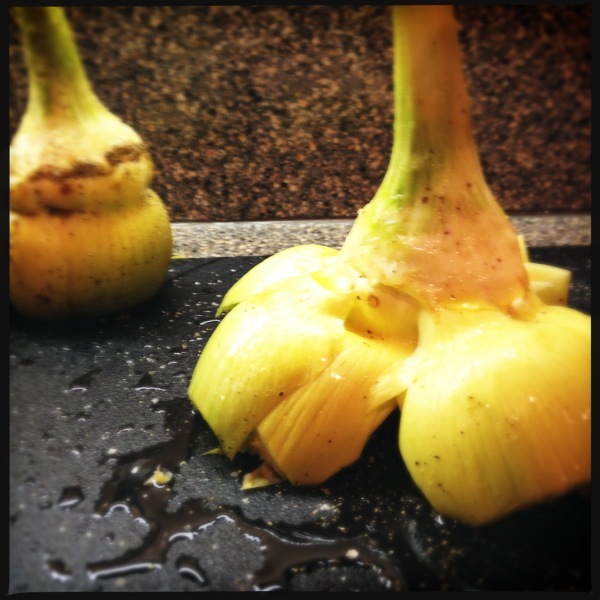 Use a vegetable peeler to peel back the rough outer layer of the stem and base of the artichoke. Soak in the lemon water. Holding each artichoke by the stem, place top side down on a flat surface, and press to loosen the leaves without breaking. 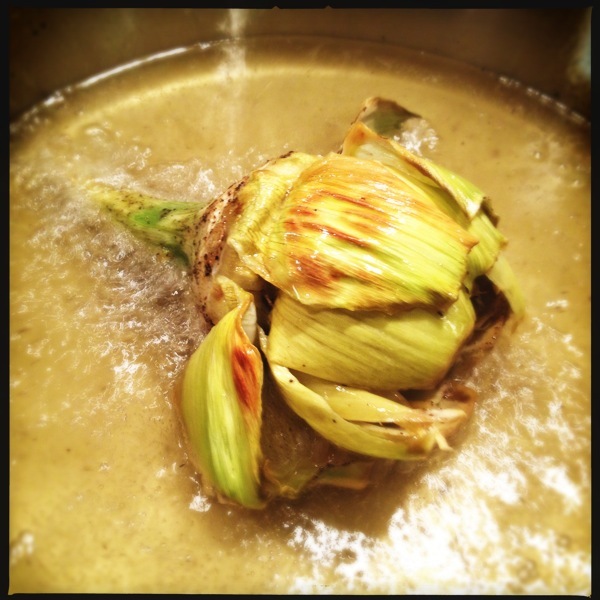 artichokes with cold water, producing steam that helps to cook the interior. Drain the artichokes on paper towels. Place top side down on a plate and let stand at least 1 hour. Reheat the oil. 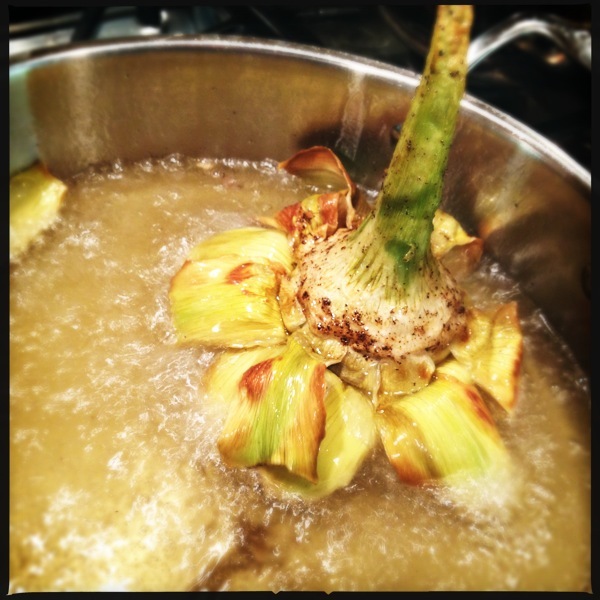 Holding each artichoke by the stem, dip into the oil, pressing the leaves against the bottom of the pan. Serve warm or at room temperature and enjoy the fruits of years of Jewish tradition.